Hi :) So this is going to be my Hair Routine.. I'll include all of the products that I use, if they're any good and products that I would NOT recommend. As I mentioned in another one of my posts, I recently decided to change the shampoo and conditioner that I use as I wasnt pleased with the results I was getting from Tresemmes Salon Silk Shampoo and John Freidas Sheer Blonde Go Blonder. For the simple reasons that the shampoo did not make my hair feel or appear even remotely like salon silk, if anything it felt dry and looked worn. And go blonder should of been titled go yellow because that is definitely the way my hair was turning using this. I definitely DONT recommend these products. I recently purchased the Toni & Guy Blonde Instant Calmer and Strengthener and have been using it for about a fortnight now, I apply it when my hair is wet to the roots and ends. This product seems to do the job that I bought it to do though I dont feel I like it enough to shout about it.. I guess we'll have to wait and see. I do have one complaint however, the product is a thick bright gold and glittery cream.. it leaves my hands extremely shimmery (which is fine because its easy enough to wash them) but all this shimmer and I see none in my hair.. what's that about? I do hope that I learn to love this product but I guess we'll just have to wait and see.. I would always rather leave my hair to dry! I hate attacking it with a hair dryer unless it is to get a bit of volume. So I dont use a heat protectant when I blow dry but I always do while straightening! 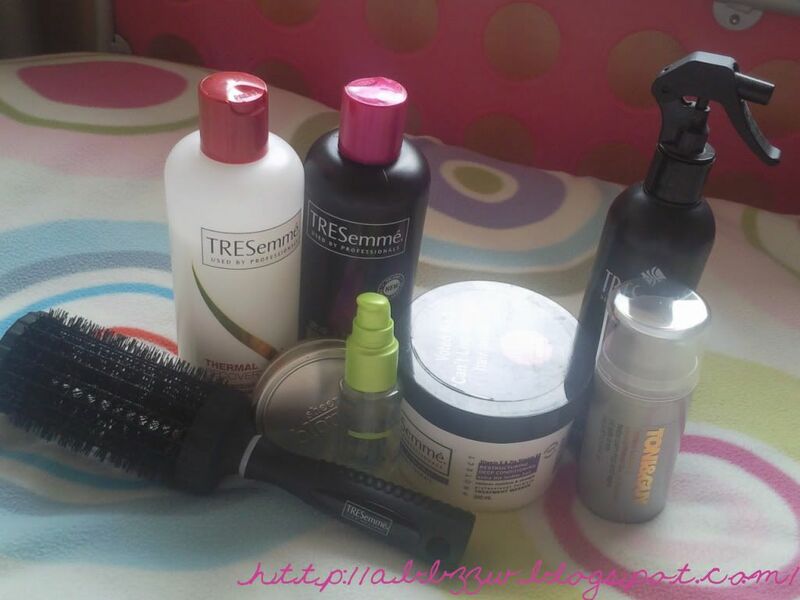 I reach for Tresemme heat protectant for each layer I straighten. Alsooo.. I never pull my hair dead staright because the way that it frames my face isnt nice, theres just no shape to it! So i pull it up at the roots for a bit of volume and so as not to flatten any that I have just created and then I curl under the ends and fringe just enough to bring it into my face or simply make it not too straight! I dont use a serum very often but when i do I reach for Avons Dry Ends serum, for the simple reason that if i havnt had my hair cut for a while then the tinyest amount of this works wonders. To finish my hair off especially after blow drying or straightening it I will run a small amount of John Frieda Spun Gold shine balm through hair (mainly the roots and ends) to get rid of any frizzyness and add a bit of shine but not too much :) This is without a doubt my favourite product of my hair routine and also the one that I always carry around with me to catch those fly aways or to give my my hair a lift during the day. Unfortunately this isnt my natural hair colour.. Naturally I am an ash blonde or mousey blonde (how my hairdresser describes it) I dye my hair every 3-5 weeks depending on its growth and how much the colour has faded - this time around it was 5 weeks before i started to see a darker blonde coming through. I use Garnier Nutrisse in shade 10 Camomile (yes the same as Anna - the style diet) it really is such a gorgeous colour! I love it on the both of us :) And Garnier Nutrisse is amazing! The day after I dye my hair is actually when my hair feels the softest and strongest throughout the whole month. I definitely recommend this dye and the conditioner that comes with it is incredible! If i could use it everyday then I would. Hope you enjoyed this guys.. once again i'm really sorry it's so long!